Crossing the Rubicon: Is it Time for Tier Ones to Move to a Real-Time Analytics BSS? Certain momentous decisions have altered the course of human history. The Rubicon River marked the northern boundary of the city of Rome. And for Julius Caesar to cross the Rubicon as head of an army in battle gear was considered treason. But he took that risk, marched to Rome, and overthrew the Republic to become ruler of an Empire that would last 500 years. Is the telecom back office ready for such momentous change? In the face of revolutionary developments in the last 10 years -- the cloud, big data, mobile broadband, and coopetition with OTT players -- will tier one operators continue to maintain their quilt works of legacy and adjunct platforms? Will that be sufficient? Or will they cast their dice and choose to radically transform their BSS architecture into something more integrated, more flexible and specifically designed to address problems and opportunities of the new telecom era? Well one BSS company, AsiaInfo, is decidedly in the “radically transform” camp. People in EMEA and the Americas are just getting to know AsiaInfo, but as the leading BSS vendor in China, AsiaInfo has proven it can manage BSS systems that scale. One of its customers, China Mobile, has no less than 750 million subscribers. 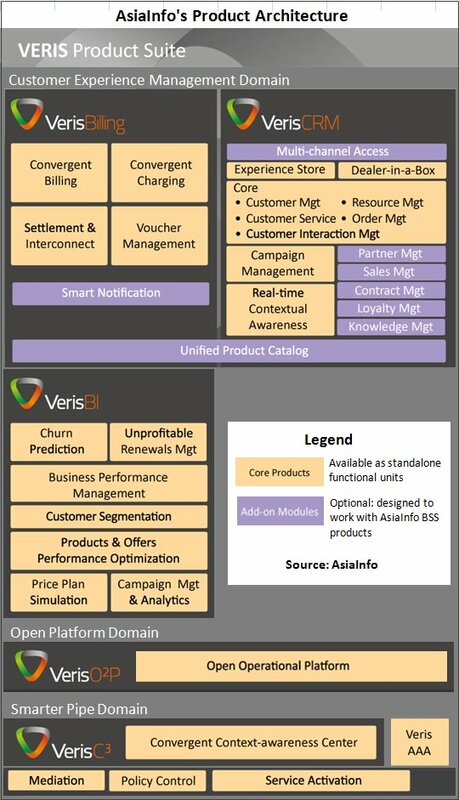 And its real-time analytics and telco/retailer partnering expertise was the feature of a previous Black Swan story. So joining us is the VP of Product Marketing at AsiaInfo, Andy Tiller. Andy, headquartered in London and responsible for AsiaInfo’s push into EMEA, gives us a wide-ranging view of the BSS opportunities and issues in this interview: real-time analytics, billing for enterprises, partnering mashups, an update on his company’s on-going transformation work at Telenor, and more. Dan Baker: Andy, why don‘t we start with analytics where AsiaInfo has a lot of experience particularly on the real-time side of things. Andy Tiller: Dan, real-time for us is usually about understanding the context of a customer: what are they doing right now? Are they visiting a particular website and what type of device are they on? That information can be used in real-time to trigger a response. Maybe you know they are running low on their data allowance and they are trying to watch a video. So at that point you could remind them that they will be out of data soon and so you make a “Click here” offer to them to get an extra day’s worth of data for a modest extra charge. Something like that is a win/win for the user and the operator. Now to make this work, you simply must do it at exactly the right time. If the message is delivered at a random time, the customer just doesn‘t need it quite then. And if you submit your offer for an extra day of service two hours too late, the customer is disappointed to see what he could have saved. Real-time is also important for providing timely support. For instance, one operator is keen to know exactly when a person swaps out the SIM card into a new device -- and what that device is. It may be the customer bought an unlocked smartphone through eBay, which could be an opportunity to reach out to the customer and offer them advice and support. Or the customer receives poor service: they had three dropped calls in the last 24 hours. So maybe that triggers an outbound call or a promise to give them some credit and an apology via SMS. The whole idea is to improve customer experience by turning a poor experience into a delightful one. When that happens, then the customer’s on your side because you noticed straight away that they had a bad experience. And maybe you prevented them from putting something negative on social media. How do you technically achieve this real-time capability in the BSS? In the case of Veris C3, our convergent context awareness center we essentially packaged up our own technology for deep packet inspection (DPI), stream computing, and IBM’s analytics-tuned database. We packaged that all up to create an appliance that’s easy to drop into the network. Now DPI is usually associated with in-line software to control the network or change policy etc. Ours is different. We use DPI as part of C3 to identify what application the subscriber is using on their smartphone right now, what’s their location, which categories of websites are they visiting? It basically works off a copy of the in-line data stream; we feed that into our platform which structures it in real-time. And while the DPI engine is collecting and organizing the data, it’s also in real-time figuring out the context -- somebody opens a music app at a music festival and that might be the time to send them an offer. This technology is mature since it’s been used in China for many years. But you have to keep your libraries up to date, so if Skype changes its protocol, you can still recognize the Skype signals. In that respect, it’s like your anti-virus software. You have to keep it refreshed. For web categorization, we can plug in third party libraries to determine whether the particular page the user is looking at is a sports page, news page, etc. As well as C3, Veris also includes a comprehensive CRM suite and real-time analytics is part of that, particularly when the call center agent needs an up-to-date view of what the customer’s context is right now. In self-service applications, too, operators want to present a message to the customer that is relevant to them. So there’s great interest in systems that can customize the offer ad -- what the customer sees on the eShop web page or when they open up the app. The Telenor deal is significant, not just because it’s AsiaInfo’s first big win in EMEA, but also because major BSS transformations are rather rare these days. Yes, it truly is big because it calls for a full replacement of the IT assets Telenor uses in Denmark, with other countries planned afterward. In Denmark about 100 total systems are being replaced and they include: billing, CRM, and analytics. As you know, there’s risk involved in changing so many systems, but Telenor considered this overhaul a business necessity. One key driver was they wanted to differentiate through the customer experience. That’s where the analytics and other real-time capabilities came in. Secondly they needed to transform the business to make money in new ways. For instance by adding more value to OTT services and running two-sided partnership models with OTTs. They also wanted to reduce the cost of operating their business IT systems. And it’s not just the high cost to maintain multiple systems and keep them integrated, but also the daily operating costs. For instance, if call center agents are opening 5 different applications to complete one task, then your average handling time goes up. So they wanted to rationalize, simplify and upgrade to a much more modern architecture to enable all of this. What do you feel were the chief reasons you won the bid. Well, we could show them that a lot of the things they wanted to do we have done before in Asia. An example: they wanted a multi-country operation using multi-tenancy, so you could have a centralized BSS stack that runs in a central location, but from which multiple countries can serve local requirements. Multi-tenancy really tilts IT towards the cloud model where the software can be in a private cloud and operated by the individual country with full control. You gain a lot of economies of scale and operational efficiency that way. Also our ability to resource a project like this at reasonable cost was a strong factor too. With our revenues of $600 million we can afford to employ 11,500 people whereas a lot of similar size competitors have 3,000 or 5,000 people because their core competencies are in much higher cost markets. So while it’s expensive to have a team in Denmark, overall our cost base is much lower because the bottom of the iceberg is in China. What about the systems integration aspects of the project? AsiaInfo is the prime systems integrator on the project and we’ve contracted with other firms to help out in specific areas. The heart of the system will be our own technology, which includes CRM and billing. And that’s where we differ from an Accenture or Capgemini. If the operator wants to use third party software and none of the core pieces are ours, then we wouldn‘t volunteer ourselves as a systems integrator for that. And yet we are agnostic. If an operator wants to work with a systems integrator, that’s ok with us. But the trend in the marketplace seems to be that operators increasingly don‘t want to do it that way. Many favor the approach Telenor is using: have a direct relationship with whoever supplies the core technology at the heart of the BSS. And in that way they can fix end-to-end responsibility. As the telecom business moves forward, how important is serving enterprise customers going to be? It’s very important. But the operator needs to go beyond its traditional communications services to exploit that to the maximum. A lot of operators might offer cloud-based infrastructure as a service to business customers. Increasingly enterprise is covering M2M services where in order to add more value, operators need to do a lot more than provide a bunch of SIM cards and simple connectivity. Certainly it’s starting in places like health care and in-car telematics, but in practice I’m not sure that the majority of operators are doing a lot there yet. China is the biggest market for M2M today and we are working with the operators there. We helped China Unicom to provide the end-to-end in-car telematics service for BMW in Shanghai. The SIM cards are located in the rear-view mirrors. Now billing for enterprises requires greater sophistication. For instance, the system must recognize that employees of a company may also be consumer customers of the operator as well. Especially with BYOD there’s an increasing need for split billing: certain things the enterprise pays for and other things the employees pay themselves. Why would a company pay for a music app? Also, the self-service aspects to serving enterprise customers are quite sophisticated. First of all, there’s probably an administrator inside the company who maintains the hierarchy of departments and users. An operator doesn‘t want to do that for its business customers. It’s the enterprise’s administrator who adds accounts and reassigns phones from one person to another. There are also different rules associated with different departments. So the sales department might get a gold package of communications services by default, whereas people who work in marketing get a bronze-level of services. However when someone moves into sales, as they transfer over, their account may be automatically switched to the rules for gold-level services. The operator wants to capitalize on other enterprise-related opportunities as well. When an employee leaves the company, for example, the operators want to follow up with that person before you lose them for good. So maybe you reach out to them and offer a plan that uses the same network and provides a personal phone with many of the same features they enjoyed on the previous company phone. So there’s a lot of potential to use modern billing and CRM systems creatively to give a better experience to business customers. M2M and working successfully with OTTs is hard for the BSS because it requires a more sophisticated partnering ability within the BSS. How do you address that issue? Well, we have something called the Open Operational Platform (O2P); its purpose is to enable operators to collaborate more effectively to create multi-party offerings. Often it makes sense to combine telecoms services with the services provided by a partner. A simple example is a movie streaming application where instead of paying a monthly subscription to Netflix and separately the data charges to the operator, you can package it into a single product that contains both. Or you might use the operator’s more sophisticated platform to create something that appeals to different segments. Normally music would be a subscription, but if you want to target prepaid customers without credit cards, you can create specific offers for prepaid such as 6 songs for a fixed price. So the telecom’s IT system needs to enable these mashup offers. O2P enables that. It opens up the telecom operator’s IT systems so the OTT company can access APIs to mash up the operator’s services with its own offers. The operator basically publishes APIs to O2P and the platform enforces the business process for approvals and taking the mashup service live. O2P also orchestrates the order process and provisioning between the two companies‘ IT systems. If you want to order the new mashup service using the partner’s or operator’s self-care website, both ends get provisioned and activated. So O2P provides the glue between the external parties’ systems. Andy, thanks for all the interesting subjects you discussed. And good luck in your on-going work with Telenor. Andy Tiller is Vice President, Corporate Product Marketing at AsiaInfo, joining the firm in 2012 to create a global Product Marketing function based out of the new European HQ office in Cambridge, UK. Prior to joining AsiaInfo, Andy served in various marketing and strategy roles for ip.access; ShoZu, and Geneva Technology, where he helped to create a successful strategy for the company’s entry into the mobile billing market, followed by a successful acquisition of the company by Convergys. Andy holds a PhD in Theoretical Chemistry from Cambridge University. The Digital Enabler: A Charging, Self-Care & Marketing Platform at the Core of the Mobile Business — interview with Jennifer Kyriakakis — The digital enabler is a central platform that ties together charging, self-care, and marketing. The article explains why leading operators consider digital enablers pivotal to their digital strategies. Crossing the Rubicon: Is it Time for Tier Ones to Move to a Real-Time Analytics BSS? — interview with Andy Tiller — Will tier one operators continue to maintain their quilt works of legacy and adjunct platforms — or will they radically transform their BSS architecture into a new system designed to address the new telecom era? An advocate for radical transformation discusses: real-time analytics, billing for enterprises, partnering mashups, and on-going transformation work at Telenor. Enabling Telecoms & Utilities to Adapt to the Winds of Business Change — interview with Kirill Rechter — Billing is in the midst of momentous change. Its value is no longer just around delivering multi-play services or sophisticated rating. In this article you’ll learn how a billing/CRM supplier has adapted to the times by offering deeper value around the larger business issues of its telecom and utility clients. Billing As Enabler for the Next Killer Business Model — interview with Scott Swartz — Facebook, cloud services, and Google Ads are examples of innovative business models that demand unique or non-standard billing techniques. The article shows how flexible, change-on-the-fly, and metadata-driven billing architectures are enabling CSPs to offer truly ground breaking services. A Cynic Converted: IN/Prepaid Platforms Are Now Pretty Cool — interview with Grant Lenahan — Service delivery platforms born in the IN era are often painted as inflexible and expensive to maintain. Learn how modern SDPs with protocol mediation, high availability, and flexible Service Creation Environments are delivering value for operators such as Brazil’s Oi. Pure Play NFV: Lessons Learned from Masergy’s Virtual Deployment for a Global Enterprise — interview with Prayson Pate — NFV is just getting off the ground, but one cloud provider to enterprises making a stir in virtual technology waters is Masergy. Here are lessons learned from Masergy’s recent global deployment using a NFV pure play software approach. Delivering Service Assurance Excellence at a Reduced Operating Cost — interview with Gregg Hara — The great diversity and complexity of today’s networks make service assurance a big challenge. But advances in off-the-shelf software now permit the configuring and visualizing of services across multiple technologies on a modest operating budget. Are Cloud-Based Call Centers the Next Hot Product for the SMB Market? — interview with Doron Dovrat — Quality customer service can improve a company’s corporate identity and drive business growth. But many SMBs are priced out of acquiring modern call center technology. This article explains the benefits of affordable and flexible cloud-based call centers. Flexing the OSS & Network to Support the Digital Ecosystem — interview with Ken Dilbeck — The need for telecoms to support a broader digital ecosystem requires an enormous change to OSS infrastructures and the way networks are being managed. This interview sheds light on these challenges. Paradigm Shift in OSS Software: Network Topology Views via Enterprise-Search — interview with Benedict Enweani — Enterprise-search is a wildly successful technology on the web, yet its influence has not yet rippled to the IT main stream. But now a large Middle Eastern operator has deployed a major service assurance application using enterprise-search. The interview discusses this multi-dimensional topology solution and compares it to traditional network inventory. The Multi-Vendor MPLS: Enabling Tier 2 and 3 Telecoms to Offer World-Class Networks to SMBs — interview with Prabhu Ramachandran — MPLS is a networking technology that has caught fire in the last decade. Yet the complexity of MPLS has relegated to being mostly a large carrier solution. Now a developer of a multi-vendor MPLS solutions explains why the next wave of MPLS adoption will come from tier 2/3 carriers supporting SMB customers. Driving Customer Care Results & Cost Savings from Big Data Facts — interview with Brian Jurutka — Mobile broadband and today’s dizzying array of app and network technology present a big challenge to customer care. In fact, care agents have a hard time staying one step ahead of customers who call to report problems. But network analytics comes to the rescue with advanced mobile handset troubleshooting and an ability to put greater intelligence at the fingertips of highly trained reps.
Hadoop and M2M Meet Device and Network Management Systems — interview with Eric Wegner — Telecom big-data in networks is more than customer experience managment: it’s also about M2M plus network and element management systems. This interview discusses the explosion in machine-to-machine devices, the virtues and drawbacks of Hadoop, and the network impact of shrink-wrapped search. The Data Center & Cloud Infrastructure Boom: Is Your Sales/Engineering Team Equipped to Win? — by Dan Baker — The build-out of enterprise clouds and data centers is a golden opportunity for systems integrators, carriers, and cloud providers. But the firms who win this business will have sales and engineering teams who can drive an effective and streamlined requirements-to-design-to-order process. This white paper points to a solution — a collaborative solution designs system — and explains 8 key capabilities of an ideal platform. Big Data: Is it Ready for Prime Time in Customer Experience Management? — interview with Thomas Sutter — Customer experience management is one of the most challenging of OSS domains and some suppliers are touting “big data” solutions as the silver bullet for CEM upgrades and consolidation. This interview challenges the readiness of big data soluions to tackle OSS issues and deliver the cost savings. The article also provides advice on managing technology risks, software vendor partnering, and the strategies of different OSS suppliers. Calculated Risk: The Race to Deliver the Next Generation of LTE Service Management — interview with Edoardo Rizzi — LTE and the emerging heterogeneous networks are likely to shake up the service management and customer experience management worlds. Learn about the many new network management challenges LTE presents, and how a small OSS software firm aims to beat the big established players to market with a bold new technology and strategy. Decom Dilemma: Why Tearing Down Networks is Often Harder than Deploying Them — interview with Dan Hays — For every new 4G LTE and IP-based infrastructure deployed, there typically a legacy network that’s been rendered obsolete and needs to be decommissioned. This article takes you through the many complexities of network decom, such as facilities planning, site lease terminations, green-safe equipment disposal, and tax relief programs. Migration Success or Migraine Headache: Why Upfront Planning is Key to Network Decom — interview with Ron Angner — Shutting down old networks and migrating customers to new ones is among the most challenging activities a network operators does today. This article provides advice on the many network issues surrounding migration and decommissioning. Topics discussed include inventory reconciliation, LEC/CLEC coordination, and protection of customers in the midst of projects that require great program management skills. Navigating the Telecom Solutions Wilderness: Advice from Some Veteran Mountaineers — interview with Al Brisard — Telecom solutions vendors struggle mightily to position their solutions and figure out what to offer next in a market where there’s considerable product and service crossover. In this article, a veteran order management specialist firm lays out its strategy for mixing deep-bench functional expertise with process consulting, analytics, and custom API development. Will Telecoms Sink Under the Weight of their Bloated and Out-of-Control Product Stacks? — interview with Simon Muderack — Telecoms pay daily for their lack of product integration as they constantly reinvent product wheels, lose customer intelligence, and waste time/money. This article makes the case of an enterprise product catalog. Drawing on central catalog cases at a few Tier 1 operators, the article explains the benefits: reducing billing and provisioning costs, promoting product reuse, and smoothing operations. Virtual Operator Life: Enabling Multi-Level Resellers Through an Active Product Catalog — interview with Rob Hill — The value of product distribution via virtual operators is immense. They enable a carrier to sell to markets it cannot profitably serve directly. Yet the need for greater reseller flexibility in the bundling and pricing of increasingly complex IP and cloud services is now a major channel barrier. This article explains what’s behind an innovative product catalog solution that doubles as a service creation environment for resellers in multiple tiers. Telecom Blocking & Tackling: Executing the Fundamentals of the Order-to-Bill Process — interview with Ron Angner — Just as football teams need to be good at the basics of blocking and tackling, telecoms need to excel at their own fundamental skillset: the order-to-cash process. In this article, a leading consulting firm explains its methodology for taking operators on the path towards order-to-cash excellence. Issues discussed include: provisioning intervals; standardization and simplicity; the transition from legacy to improved process; and the major role that industry metrics play. Wireline Act IV, Scene II: Packaging Network & SaaS Services Together to Serve SMBs — by John Frame — As revenue from telephony services has steadily declined, fixed network operators have scrambled to support VoIP, enhanced IP services, and now cloud applications. This shift has also brought challenges to the provisioning software vendors who support the operators. In this interview, a leading supplier explains how it’s transforming from plain ol‘ OSS software provider to packager of on-net and SaaS solutions from an array of third party cloud providers. Telecom Merger Juggling Act: How to Convert the Back Office and Keep Customers and Investors Happy at the Same Time — interview with Curtis Mills — Billing and OSS conversions as the result of a merger are a risky activity as evidenced by famous cases at Fairpoint and Hawaiian Telcom. This article offers advice on how to head off problems by monitoring key operations checkpoints, asking the right questions, and leading with a proven conversion methodology. Is Order Management a Provisioning System or Your Best Salesperson? — by John Konczal — Order management as a differentiator is a very new concept to many CSP people, but it’s become a very real sales booster in many industries. Using electronics retailer BestBuy as an example, the article points to several innovations that can — and are — being applied by CSPs today. The article concludes with 8 key questions an operator should ask to measure advanced order management progress. NEC Takes the Telecom Cloud from PowerPoint to Live Customers — interview with Shinya Kukita — In the cloud computing world, it’s a long road from technology success to telecom busness opportunity. But this story about how NEC and Telefonica are partnering to offer cloud services to small and medium enterprises shows the experience of early cloud adoption. Issues discussed in the article include: customer types, cloud application varieties, geographic region acceptance, and selling challenges. Real-Time Provisioning of SIM Cards: A Boon to GSM Operators — interview with Simo Isomaki — Software-controlled SIM card configuration is revolutionizing the activation of GSM phones. The article explains how dynamic SIM management decouples the selection of numbers/services and delivers new opportunities to market during the customer acquisition and intial provisoining phase. Achieving Revenue Maximization in the Telecom Contact Center — interview with Robert Lamb — Optimizing the contact center offers one of the greatest returns on investment for a CSP. The director of AT&T’s contact center services business explains how telecoms can strike an “artful balance” between contact center investment and cost savings. The discussion draws from AT&T’s consulting with world class customers like Ford, Dell, Discover Financial, DISH Network, and General Motors. Mobile Broadband: The Customer Service Assurance Challenge — interview with Michele Campriani — iPhone and Android traffic is surging but operators struggle with network congestion and dropping ARPUs. The answer? Direct resources and service quality measures to ensure VIPs are indeed getting the quality they expect. Using real-life examples that cut to the chase of technical complexities, this article explains the chief causes of service quality degradation and describes efficient ways to deal with the problem. Telco-in-a-Box: Are Telecoms Back in the B/OSS Business? — interview with Jim Dunlap — Most telecoms have long since folded their merchant B/OSS software/services businesses. But now Cycle30, a subsidiary of Alaskan operator GCI, is offering a order-to-cash managed service for other operators and utilities. The article discusses the company’s unique business model and contrasts it with billing service bureau and licensed software approaches. Bricks, Mortar & Well-Trained Reps Make a Comeback in Customer Management — interview with Scott Kohlman — Greater industry competition, service complexity, and employee turnover have raised the bar in the customer support. Indeed, complex services are putting an emphasis on quality care interactions in the store, on the web, and through the call center. In this article you’ll learn about innovations in CRM, multi-tabbed agent portals, call center agent training, customer treatment philosophies, and the impact of self-service. 21st Century Order Management: The Cross-Channel Sales Conversation — by John Konczal — Selling a mobile service is generally not a one-and-done transaction. It often involves several interactions — across the web, call center, store, and even kiosks. This article explains the power of a “cross-channel hub” which sits above all sales channels, interacts with them all, and allows a CSP to keep the sales conversation moving forward seamlessly. Building a B/OSS Business Through Common Sense Customer Service — by David West — Delivering customer service excellence doesn‘t require mastering some secret technique. The premise of this article is that plain dealing with customers and employees is all that’s needed for a winning formula. The argument is spelling out in a simple 4 step methodology along with some practical examples.